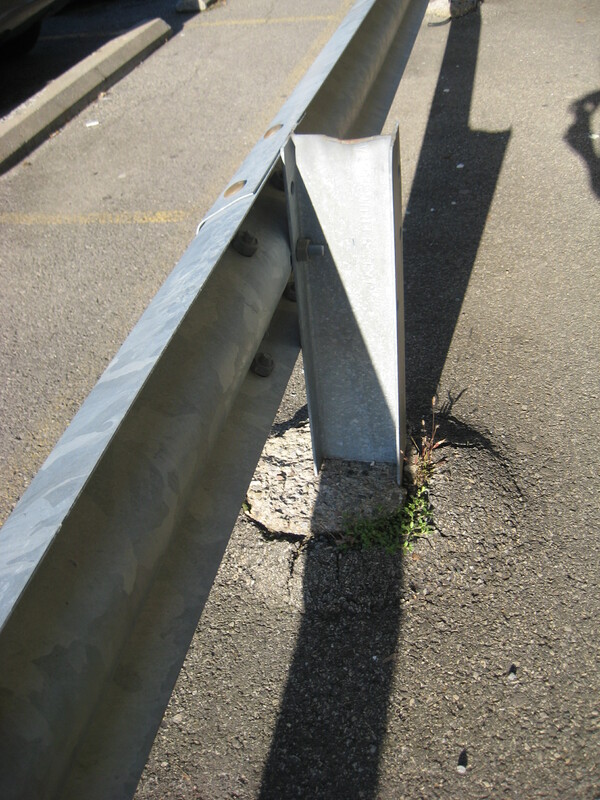 An unlikely habitat for plants, this metal guardrail stuck into concrete embedded in blacktop. 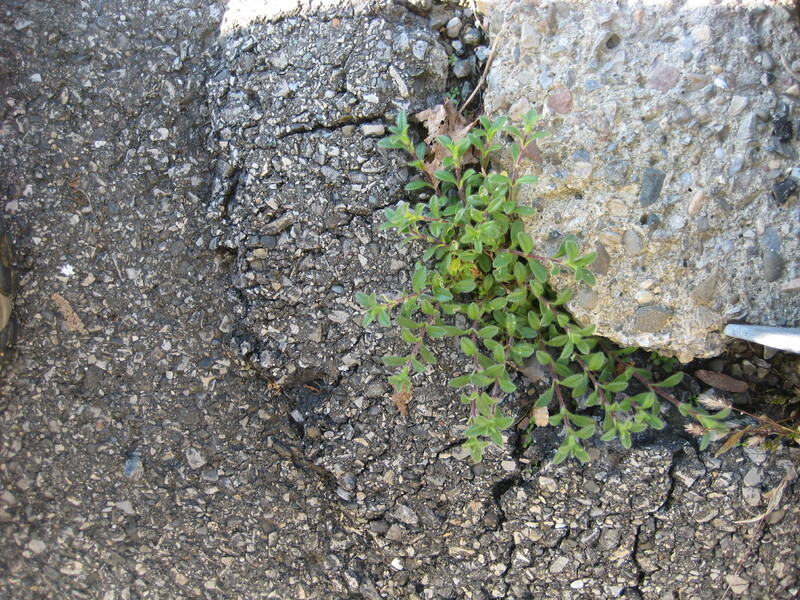 But where there’s a crack, there’s a leaf. Hm. Small, dainty leaves, arranged opposite each other in pairs. Looks like Chickweed. But which one? 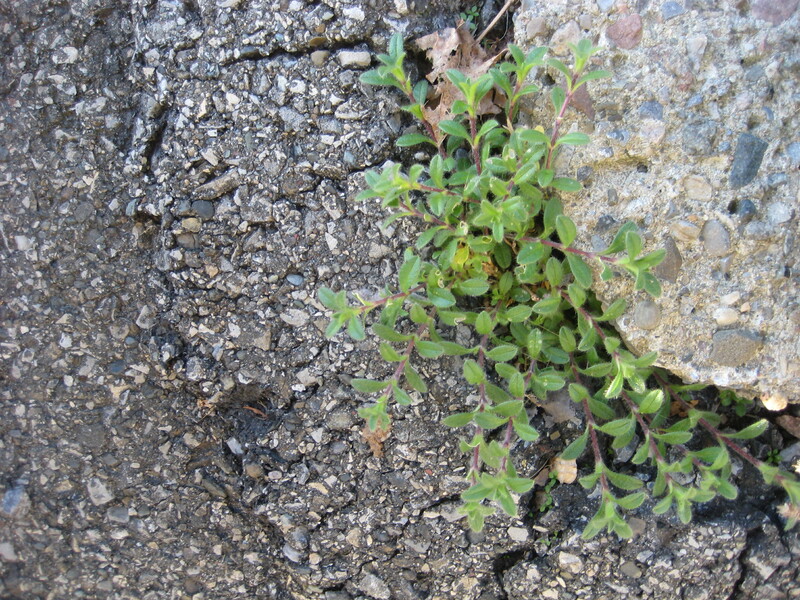 There are dozens of types of Chickweed. Further research reveals it to be Mouse-Eared Chickweed. An apt name—the furry little leaves look exactly like mouse ears. And like a resourceful mouse, it can find a hole or a crack anywhere, and exploit it to its own advantage. When the plant flowers, it has tiny white heart-shaped petals, very pretty. A pleasant little plant, not native, but harmless—in fact quite nutritious as a salad green, if you don’t mind a little fuzz in your salad. Ah—but wait. Which mouse-eared chickweed is this? The more you learn, the more you discover how much there is to learn. Turns out there are more than a hundred species of Mouse-Eared Chickweeds. (Some botanists argue that they’re subspecies.) There’s Alpine Mouse-Eared Chickweed. Boreal Mouse-Eared Chickweed. Sticky Mouse-Eared Chickweed, Clammy Mouse-Eared Chickweed… Or if you prefer Latin, Cerastium alpinum, beibersteinii, glomeratum…I sometimes wonder if botanists have way too much time on their hands. This is probably Cerastium vulgatum, Common Mouse-Eared Chickweed. Although some sources use the name Common Mouse-Eared Chickweed for other species, like Cerastium fontanum…makes your head spin. Let’s just settle for calling it Mouse-Eared Chickweed, and admiring the little rodent’s hardihood. Not only can they germinate just about anywhere, the seeds can lie dormant in the soil and still be viable for not just years, but decades. 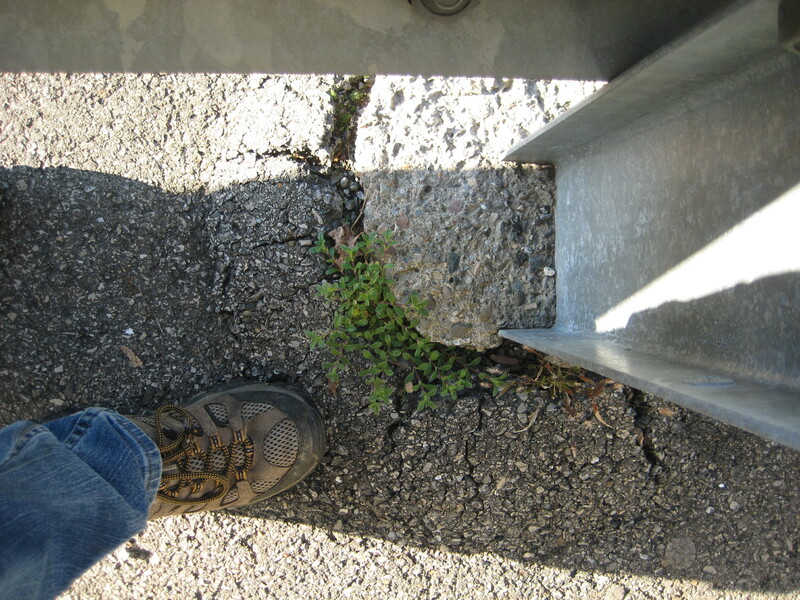 The resilient little seeds can pass unharmed through the digestive tracts of horses, cows, birds, even worms, then bide their time hidden in a crack for half a century, and still sprout when conditions are right. Like the mice it’s named for, this plant is small, inconspicuous, cute and fuzzy—and a ruthless survivor. Ah, but why chickweed. I wonder if chicks and chickens like to eat it. I bet they do. I’ll have to keep an eye on our chickens to see if they might dine on it.